Where can I get the Rainbow Pages? The Rainbow Pages features news, information, resources, events and businesses that support the LGBTQA community. Started in 2014, our portfolio includes an annual print publication, an app for iPhone & Android, a website and a monthly newsletter. In addition, you can find us on Facebook. We reach more than 15,000 people throughout Southwest Florida through all our products as well as our participation and sponsorship of various events. Nonprofit resources, events, news and job lists are included for free. For more information, email info@rainbowpagesswfl.com or call 239.234.2420. If you’d like to advertise, please download the rate card and contract form. Nonprofit organizations and events are included in the Rainbow Pages for free. To submit a resource or organization, please fill out the online form. You can submit an event to our calendar. Annual high-glossy magazine 5,000 distributed 200 SWFL locations (paid distribution). Here is a link to the 2018 Edition. 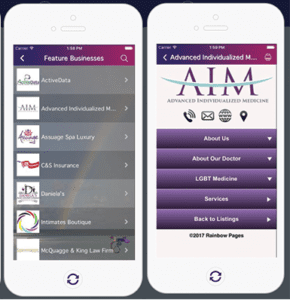 Your business listing in the business directory and featured businesses in the app. Your business in a searchable directory on website. Includes multi-tab page with info about your business. One click phone, email and directions. More than 600 monthly users. Includes events, photos, news, information, searchable resource & business directory. Limited advertising spots are available on the website and the newsletter. The ad size is 300 by 250 px.